The overwhelming whiteness of genetics research is holding back medicine. In the future, it’s possible that when you go in for a physical, your doctor will, along with the usual blood pressure test and bloodwork, analyze your genome for health risks lurking in the code of your DNA. It’s possible your genome will suggest you’re at high risk of developing heart disease. If you are, your doctor may start you on cholesterol-lowering drugs early or could also, maybe, make predictions about what other medications are most likely to work to prevent the disease. A treatment plan like this — tailored to an individual’s genetic risk — is one of the great promises of “precision medicine.” Whether genomic analysis will ever yield enough useful results to make it possible is a subject of heated debate. If it does pan out, it could be a game changer. Though, as it stands, the game won’t be changed for everyone: If you’re not white, this new research may fail you. If the new age of “precision medicine” is going to be equitable, we’ll have to fix this. There’s an important lesson in diversity and genetics lurking here too. It’s not that people of different ethnic backgrounds have wildly different biology. It’s much more subtle, and fascinating, than that. We need to explore the vast range of human genetic variation: It could end up saving us all. But the reason the test won’t work for most of the world’s population is simple: Most participants in the studies that yield predictive insights — genome-wide association studies (or GWAS for short) — are of white European ancestry. 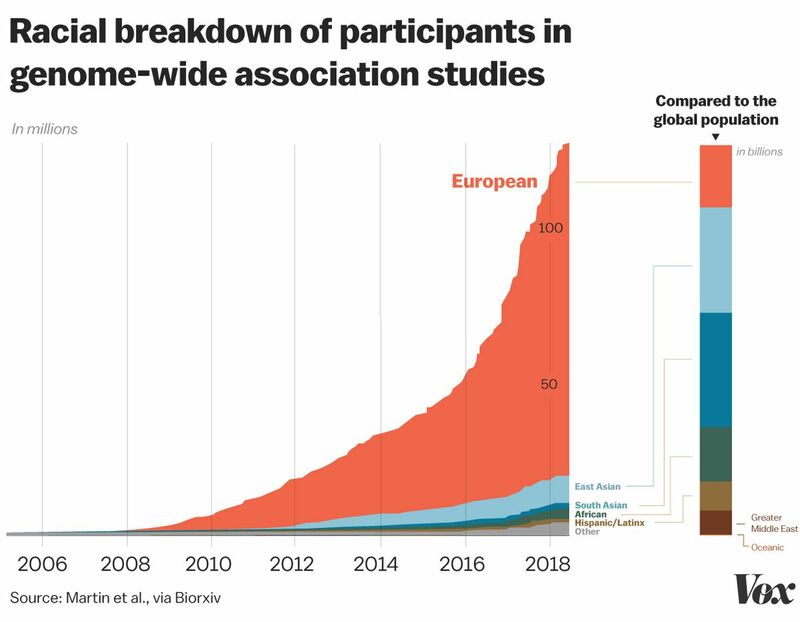 In all, white people of European ancestry make up 80 percent of the participants in all these studies, despite only representing a fraction of the world’s population. This is “a vast disparity, and it hasn’t been getting a whole lot better,” says Alicia Martin, a geneticist at the Broad Institute who has co-authored papers on racial disparities in genetics research. You can see the disparity clearly in the following chart. It plots the number of individuals used in GWAS studies over time. While there’s been some progress in recent years, the participants are still overwhelmingly white — despite the fact that white Europeans represent just a fraction of the world’s population. The disparity matters for a simple reason: We are developing genetic risk tools that people of color will not benefit from, unless we do genetic risk studies for them too. It’s adding to the long-standing problem of people of color being excluded from medical research. And it could also end up increasing health care disparities in America — which are already stark and stubborn. For instance, in the past few years, researchers have learned that the genetic variants that can contribute to asthma in white children aren’t the same for African-American children. Imagine a (hypothetical) genetic test at infancy that could be used to start preventive asthma treatment on the first day of life. It would be a great tragedy if all of these tools were not useful for African-American children, who are disproportionately affected by asthma. When minorities aren’t included in scientific research, they can suffer. The cures derived from the research may not work as well for them. Diagnostic tests might fail them. Again, this isn’t just a hypothetical: It has already happened in some cases. You may recall from high school biology that a strand of DNA is made up of a string of nucleotides: adenine, guanine, cytosine, and thymine. These are the letters that spell out the recipe for our biology. You, me, Neil deGrasse Tyson, Kim Kardashian — indeed, all of humanity — share 99.9 percent of all the identical letters of DNA. GWASs look for the sites on the genome where we commonly differ from one another. These sites are called single nucleotide polymorphisms — a.k.a. SNPs, or “snips” — and they’re simply spots where you might have the nucleotide adenine and I’ll have a cytosine. Some of these SNPs are meaningful for our health, and activate the biological pathways that make some of us taller than others, smarter than others, or healthier than others. Others are just kind of randomly acquired through generations and don’t tell us all that much besides for our geographic ancestry. To be very clear: African, Asian, Native American, Ashkenazi Jew, and European biology is not different from one another. None of this is evidence that race is a “biological construct” (which it isn’t). What can be different among various ethnic groups is the patterns of genes we inherit from our families. “It’s a difference in terms of disease, and what causes disease,” says Emmanuel Peprah, a global health scientist at NYU. Most humans will be at higher risk of heart attacks when there’s more LDL cholesterol in their blood; that’s the basic biology. The differences here are more about why LDL accumulates greatly in one person and not another. There are some diseases and physical traits that are caused by a change in a single gene. Examples include sickle cell disease, which affects many African Americans, and Huntington’s disease, which deteriorates nerve cells in the brain. Whether the bottom of your earlobes stick to the side of your face or hang free is the result of one gene. But even more diseases and physical traits are polygenic. For instance, there are hundreds of locations in the genome that influence diabetes. And each of them changes the odds of developing diabetes minutely. Heart disease risk is polygenic; so is intelligence and height. GWAS works to identify the constellation of genetic changes that make it slightly more or less likely you’ll have a trait or a disease. And that’s the basis of genetic risk prediction: Labs read your genome and essentially tally up your genetic variants that signal risk. For these studies to work — that is, for them to yield the genetic markers that most accurately predict biological outcomes — researchers have to limit subject pools to people of a common ancestry. This allows them to control for the SNPs that have nothing to do with the disease or trait they’re studying. For instance, if you did a GWAS for height that included both Southern and Northern Europeans, you’d find that the gene for lactose tolerance (the ability to drink milk without stomach problems) is associated with height. This gene has nothing to do with — or very little to do with — height. But it is picking up on the fact that Northern Europeans tend to be taller than Southern Europeans, and that they, coincidentally, are more likely to be lactose-tolerant. The GWAS, in this case, isn’t identifying biology of height; it’s identifying gene variants that are “accidentally correlated with ancestry,” says Graham Coop, a population geneticist at UC Davis, who walked me through this example. Even controlling for ancestry, researchers don’t always exactly know the biological purpose of SNPs uncovered by GWAS. The patterns of these correlations differ from one ancestral group to the next and are part of the reason why the predictive power of GWAS diminishes from one group to the next. When we don’t do genetics research on diverse populations, we not only risk widening health disparities — we risk missing out on new biology that will help us all. We could also find more cures. PCSK9 inhibitors are a new class of cholesterol-lowering drugs that show promise in lowering the chance of heart disease beyond what statin drugs can do alone. Doctors debate whether these new drugs will be worth the cost. Regardless, they’re a breakthrough: a novel way to prevent heart disease. And these drugs were discovered because researchers noticed that some African Americans had mutations on their PCSK9 genes that led them to have very low LDL cholesterol in their bloodstream. We need to explore human genetic diversity to make game-changing insights. This is something people may misunderstand about evolution: Species survive because of diversity. When change comes, there’s someone, somewhere, who can help our species survive. Genetics is helping us find those beneficial adaptations and bring them to the broader world. It’s not that individual GWAS studies need to include diverse participants. It’s that these GWASs need to be redone population by population to ensure their generalizability. Just as there is a GWAS study on hundreds of thousands of Europeans to assess genetic risk for heart attacks, there needs to be a study on many people of African origin, East Asian origin, and so on. It is changing, but too slowly. In 2009, 96 percent of participants in GWAS studies were of European descent. In 2016, that number had dropped to 80 percent of participants. There are projects in the works to diversify genetics research, which offer some reason for hope. Notably, the NIH is currently recruiting for a program called All of US. With it, the NIH aims to recruit 1 million people across the country to participate in a long-term study on the intersection of genetics, lifestyle, environment, and health. The goal: get 75 percent of the participants from groups who are typically underrepresented in biomedical research, with at least 500,000 participants from racial and ethnic minorities. “You really can’t have precision medicine for all of us if all of us don’t participate and aren’t reflected in the research and the studies,” Dara Richardson-Heron, chief engagement officer for the All of Us program, says.